Looking for best smartphone for multi-tasking than new iPhone 6 and Xperia Z3 is the col choice for you , The all new iPhone 6 with latest iOS8 and fastest A8 processor, Full HD Retina display with 3D technology, Touch ID fingerprint sensor and Apple Pay. at an Event in the Flint Center in Cupertino, California, USA. The all new iPhone 6 is available in USA at $199 for 16GB, $299 for 64GB and $399 for 128GB with contract and iPhone 6 Plus is available at Rs $299 for 16GB, $399 for 64GB and $499 for 128GB with contract. While Sony Xperia Z3 is the best multi-purpose gadget unveiled with huge 20.7-MP camera, 128GB external memory, PS4 Remote Play and IP65/68 certification Black, Copper, Silver Green, and White colour option at IFA 2014 in Berlin. New Xperia Z3 slated to launch globally by Nov. 2014. How ever Sony hasn’t confirmed the pricing and release date so far. The all new Apple iPhone 6 supports 4GLTE, Nano SIM, GPS, NFC, Fingerprint identity sensor offers you a 4.7-inch/5.5-inch Retina HD (diagonal) LED-backlit widescreen Multi‑Touch display with IPS technology, 1334-by-750-pixel resolution at 326 ppi, 1400:1 contrast ratio (typical) for non-stop entertainment from watching movies to playing games powered by fastest A8 chip with 64-bit architecture, M8 motion coprocessor with 16GB/64GB/128GB variant runs on latest iOS8 with iCloud, Siri and iTune assures world class multi-tasking. This is not enough new iPhone 6 also combines 8-MP iSight rear camera with 1.5µ pixels, Autofocus with Focus Pixels, ƒ/2.2 aperture with 1080p HD video recording (30 fps or 60 fps) and 1.2-MP front camera with ƒ/2.2 aperture and 720p HD video recording to enhance your photography through smartphone. It also packed with a powerful Built-in rechargeable lithium-ion battery promising Up to 14 hours Talk time on 3G, time:Up to 10 days (250 hours) Standby time, Internet use: Up to 10 hours on 3G, up to 10 hours on LTE, up to 11 hours on Wi‑Fi, Video playback: Up to 11 hours and Audio playback: Up to 50 hours and weight is 4.55 ounces (129 grams)/( 6.07 ounces (172 grams) )measures 5.44 inches (138.1 mm) x 2.64 inches (67.0 mm) x 0.27 inch/ 6.22 inches (158.1 mm) x 3.06 inches (77.8 mm) x 0.28 inch(7.1 mm). While New Sony Xperia Z3 is A water-proof and dust-proof(IP65/68) smartphone allows you take pictures while swimming in water for up to 30 minutes in 1.5 metres deep water. Z3 is faster, lighter and thinner than it’s predecessor Z2 supports 4G LTE, HSPA+, Wi-Fi and Wi-Fi, DLNA, GPS with A-GPS, Bluetooth v4.0, NFC, FM radio with RDS comes with a bigger 5.2-inch full- TRILUMINOS display with resolution (1080×1920 pixels) and X-Reality for mobile picture engine promising world-class multi-media experience and Sony’s intuitive contrast enhancement technology helps you viewing in sharp even in bright sunlight while powerful Android 4.4 KitKat OS and 2.5GHz quad-core Snapdragon 801 processor with 3GB RAM and 16GB of internal storage which expandable up to 128GB via microSD ensures superior multi-tasking. New Xperia Z3 is the first ISO 12800 in a smartphone sporting a huge 20.7MP camera with 4K (Ultra-HD) video recording, The large 1/2.3” Exmor RS™ for mobile image sensor, pulsed LED flash, 8x digital zoom and a 2.2-MP front-facing camera for video calling packed with a powerful 3100mAh battery with battery stamina mode promising up to 19 hours of talk time, up to 740hours standby time, up to 130 hours music playback time and up to 10 hours video playback comes in a dimension at 146.5x72x7.3mm and weight just 152 grams. Sony’s intuitive contrast enhancement technology, viewing is sharp even in bright sunlight. Rivals Apple iPhone 6, HTC One(M8), Samsung galaxy K Zoom, Nokia Lumia 1020. 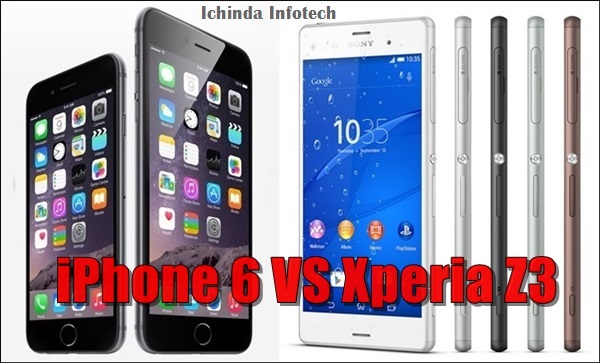 At last few honest word, all new Apple iPhone 6 and Sony Xperia Z3 is the best smartphone in world market. Now it’s on you what you want? Please be open to give your view.